On this Veterans Day 2013, we would like to say thank you to all of the men and women who have served our country. In 2011, we were lucky enough to provide a group of servicemen and women with some comfort during the holidays when we donated a giant 6 ft. lit wreath and other decorations to the United States Air Force 908th Expeditionary Air Refueling Squadron stationed in Afghanistan. We are proud that we were part of this project and look forward to being part of many more like this in the future. You can read the entire press release from the Air Force by clicking the read more button. For the past 5 years Downtown Decorations, Inc, a Syracuse based commercial holiday decoration company, has been giving back during the holiday season – particularly to the men and women in uniform serving overseas. 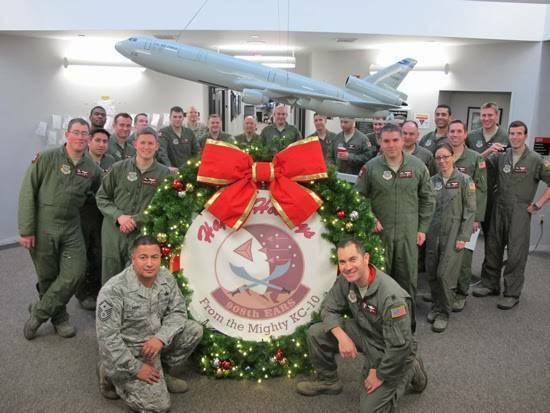 This year, Downtown Decorations was pleased to provide the men and women of the 908th Expeditionary Air Refueling Squadron stationed in Kabul, Afghanistan, the flight wing that flies the massive KC-10 airborne refueling tankers, some very much needed holiday decorations. On December 15, 2011 a shipment of holiday decorations including the flagship item: a 6ft lit, and decorated, giant artificial wreath took off from Syracuse, NY stopping first to be consolidated at Fort Bragg, CA, prior to reaching its final destination of Kabul, Afghanistan. Noteworthy national clients include: US Army, See’s Candy, Pyramid Management, General Growth Properties, Simon Property Group, City of Los Angeles, CA, City of Augusta, GA, City of Stamford, CT, City of Anchorage, AK, City of Oklahoma City, OK, City of Columbus, OH, City of Providence, RI, Tanger Outlets, and the Government of the Turks and Caicos. Other noteworthy décor projects locally include: Destiny USA, The giant 12ft wreath hung annually on the front of University hospital, décor at University Hospital, décor at Golisano Children’s Hospital, décor at Community General Hospital, and décor at the CNY Philanthropic Society, Village of North Syracuse, Village of Manlius, and the Village of Baldwinsville. Noteworthy local banner clients include: Syracuse University, Le Moyne College, Onondaga Community College, Village of Cicero, and the Valley Historic Society. Attached picture depicting the members of the 908th Expeditionary Squadron around the donated wreath from Downtown Decorations is sole property of Downtown Decorations, Inc. Downtown Decorations, Inc. grants explicit permission for use of this press release and photo in all publications. About Downtown Decorations: Downtown Decorations, Inc. is a leading national provider of commercial and municipal holiday decorations as well as light pole banners. Incorporated in 2003, Downtown Decorations is a private corporation headquartered in Syracuse, NY globally serving municipalities, retail centers, universities, corporations, hotels, casinos and event venues.